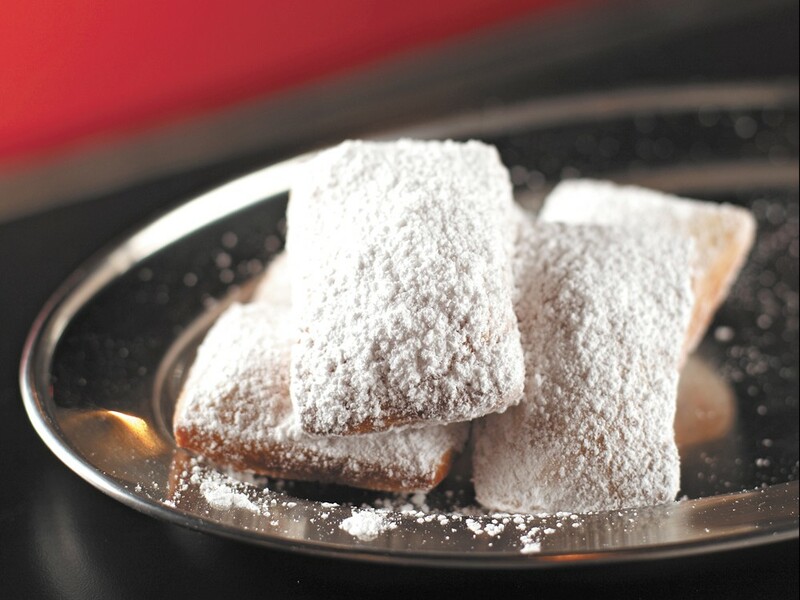 A sneak peek at Beignets\' namesake dish. The following is how you do not bring European dining atmosphere to America. You do not clad drywall in faux stone to resemble that adorable pâtisserie on the ground floor of your favorite 17th-century auberge. You do not pipe “O Sole Mio” through the speakers to evoke a longing for the Amalfi Coast. You do not — under any circumstances — ask the wait staff to wear lederhosen. It’s no use trying to make your restaurant in Spokane look like a restaurant in Zurich or Zagreb. “Those ancient cities [have] an eternal quality you can’t recreate,” says architect Armando Hurtado. Josh Hissong, a designer, nods. Hurtado and Hissong are the principals of HDG, a locally based restaurant design firm known for creating sleekly modern spaces that feature lots of crisp corners, wood-grain textures, high-shine finishes and very few fake boulders. In July of last year, Judie Sowards and her son, Ryan, approached HDG about designing their cafe, Beignets. Ryan says they didn’t have many preformed ideas. He and his mom wanted a small space that sold the namesake French pastry and chicory coffee (that concept has since added a full bar, six crepe stones and been upsized by a factor of 10). More than anything, though, the Sowards wanted HDG to help create a sense of place. “Something like Spokane has never seen,” Judie says. Ryan Sowards had coached baseball in Germany. He traveled a lot while he lived there and spent a lot of his time in former Yugoslavia. He loved the freshness of the food in Europe and the precision of the service. He loved how there were cafés on every corner and loved how farmer’s daughters tending roadside stands selling wheels of chèvre began to pop up as he climbed into the Balkan foothills above the Dalmatian Coast. The Sowards and their designers entered their first meeting in agreement. Beignets should evoke Europe without trying to copy it. They left the meeting with a key question still looming: How do you do that? In August, the Sowards, Hissong and Hurtado met in Rome and spent 10 days zigzagging more or less north — to Venice, then Monte Carlo, then Paris, then Amsterdam. The designers brought an HD video camera with a good microphone and, whenever the group stopped into a café, they’d just set the thing down and let it record. Hurtado says the way the light and shadow played off these awnings was the inspiration for the stripped motif that will run from the signage in front, through the main doors and along the walls of the space. Ryan Soward says he was struck by the way Europeans — partially because they have no choice — work with the architecture they have. The group met a woman in Paris who single-handedly waited on what Hissong thinks must have been 60 tables. “We tried to get her to move to Spokane for a couple years,” Hissong says. The server didn’t take them up on it, but she, too, became an inspiration. The Sowards have no experience running restaurants, though Judie has been in the service industry her whole career, and dreamed of owning a restaurant about as long. “Since I was a kid she talked about it,” Ryan says. They’re taking their cue as restaurateurs from all those things Europeans do right. “We want to give service like we were served,” Judie says. It goes beyond service. Ryan says he was struck by the freshness of the ingredients and the simplicity of the food. It was something he remembered from Germany. “The restaurants in downtown Munich get their meats from surrounding farms, and their produce,” he says, so they decided to go as local as possible. “We went and bought a cow,” his mother says, smiling. The video Hissong and Hurtado shot in Europe will be projected onto the far wall in massive scale, and the sounds of the streets will be piped through the speakers. The footage will change as the day wears on. Last week at Beignets, Shawn Heale, the bar manager, had begun training his bartenders. Chef Justina Panther-Renoud and her two sous chefs began finalizing and perfecting a menu that uses the crepe as a foundational starch and takes it on a tour of the continent. HDG’s red stripes still had to be installed, as did the majority of the kitchen appliances. None of the functional pieces of the space started coming together until the contractor built some of the key design elements. Beignets won’t be finished until the last little visual details are in place. This, Hurtado says, is a metaphor for the way design should bookend the dining experience in a restaurant. That impression, Hurtado says, needs to be backed up with good service and great food. If those two key facets fall flat, the design becomes moot. Nail the food and service, though, and the space becomes important again, forming the gilding that frames every experience you have in a place. Beignets, at 121 N. Wall St., will offer a beer garden on its patio and select pastries this weekend during Hoopfest. It will soft open the week after.